"ORBS IN THE CITIES OF THE DEAD"
Orbs are believed or thought to be balls of small floating bubbles of light energy. Many believe they are the deceased ghostly life forms, and are believed to be the actual photographic proof of the human soul or life force. Many Ghost Hunters/ Chasers or paranormal investigators encounter them during haunted investigations frequently. 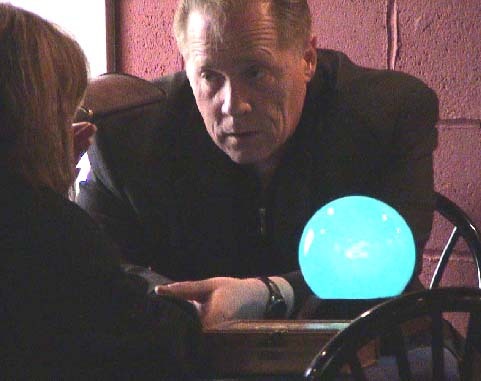 New Orleans Orb Phenomena as is the paranormal occurrence of ghost photography is not new, or localized to any particular part of the country or abode or haunted location. New Orleans Haunted Cities Of The Dead just happen to get more actual Ghost Photographs taken on a daily average by tourist and visitors then any other Cemeteries in the world. Haunted New Orleans Cemeteries have been deemed the most Photographed Cemeteries in the world. Many Ghost experts and paranormal investigators all believe that this and recommend further investigations. Many visit the tombs of New Orleans St. Louis No. 1 Cemetery ( Rated Number one on Haunted America Tours Top Ten Haunted Cemeteries in the United States ) to visit and take ghost photos of the haunted Tomb of New Orleans Voodoo Queen Marie Laveau. And the Orbs in her haunted tombs photos are often quite unique. Swirling masses of balls of ghost light. Ecto mist and large dense solid orbs. Not usually are they all located near Marie Laveus tomb but the percentage of ghost photos occur near or close to it. All of Haunted New orleans Graveyards have a high occurrence of Orbs and Ghostly mist said haunted Arkansas Ghost researcher Sidney M. Taylor. Taylor, a Ghost researcher for over 25 years has many Ghost photos from his visits to many haunted New Orleans Graveyards. These Haunted Cemeteries yield the most and the best photos of daytime orbs and anomalies 5 out of 10 times he has stated. Taylor and his family visit Haunted New Orleans on average of 5 times a year. Many of his Ghost Photos are taken At Mardi Gras time, and during many of his planed and unplanned vacations. Taylor became fascinated with Ghost photography at the age of 17 after visiting New Orleans with his family to attend New Orleans Mardi Gras. He and his parents took a New Orleans haunted Cemetery tour, and from the family Photos a few strange anomalies of Orbs and ghostly images, this set the ghost investigating obsession of his into motion. The history behind the vast "Cities Of The Dead" is fascinating. The Cemetery tombs were first built above ground because the City lies more than nine feet below actual sea level and the high water table would often push coffins and their contents back out of more traditional United States grave sites. The oldest tombs are either free-standing one or two level structures or the “brick oven” wall type that were the forerunners of the modern mausoleums. Ingenuity met necessity and soon cemeteries were beginning to be the site of major architectural memorials of finest granite and marble, some adorned with bronze urns or great statues or with handcrafted wrought iron fences that rivaled the intricate work that adorns the haunted balconies of New Orleans. Taylor's vast collection of private ghost studies photos include orbs floating around tombs and wall vaults in mass forms. All ranging in sizes from small to large, solid to transparent. His most stunning ghost photos will be published in his forth coming book in 2006, and on Haunted America Tours Official web site in the near future. Taylor like so many othersin hois feild also attends several National and reginal Ghost Conferences each yea. These attracts several hundred ghost enthusiasts from around the country. Here Sidney Taylor shares his many Ghost photos, haunted Stories and always discusses haunted New Orleans Cemeteries and the current Orb Phenomena in more depth. Taylor met Fellow ghost hunter Gina Lanier at one event recently and she opened his mind up to many a new ideas on Orbs and haunted New Orleans Cemeteries,Taylor relates with a renewed enthusiasm. Taylor's body of works cover many New Orleans Cemeteries. St. Louis Cemetery #1, Cemetery #2, Cemetery #3. Lafayette Cemetery #1, and Lafayette Cemetery #2, Metairie Cemetery, Greenwood Cemetery, Hope Mausoleum, St. Roch cemetery #1, St. Roch cemetery #2, Holt cemetery, Chalmette National Military Cemetery, Odd Fellows Rest, and many more. His Knowledge of their history and his research into specific haunted Cemetery activity certainly keeps him busy. Taylor does his private investigations of New Orleans cemeteries and feels he has found a "hot spot" where he has had great success in capturing on film many strange phenomenon under all conditions of weather, times of days and most noted the lunar cycles, a full or new moon. He has explained that he has not gone through a roll of film yet without a bunch of pictures containing orbs. One of the best photographs he has taken, he says, was that of a huge orb with what he states appears to be a face in it at the tomb of Marie Laveau. "Marie looks to be dressed late 1800's, With a high turban or scarf on her head, judging by her Voodoo garb I believe it is Marie Laveaus ghost Taylor says with confidence. There are also many brilliant transparent globes in this shot to many to count." Taylor states. Gina Lanier A well known New Orleans based Paranormal Investigator who interest in New Orleans haunted Orbs and the paranormal have taken her Investigations to many non associated haunted levels. From Haunted Mardi Gras Floats to Mardi Gras Parade dens, haunted Cemeteries buried beneath the French Quarter, And reported New Orleans HauntedPolice and fire stations. In Laniers' collection vast of Ghost Orb Photos she has many Orb photos taken at local New Orleans Cemeteries on or near Mardi gras Day Parade activity. Lanier has found through her own in depth documentation that during the New Orleans Mardi Gras Season early February through March, depending where Mardi Gras falls that calendar year. Orb activity seems to rise in New Orleans Cemeteries. Gina suggest it's because of all the crowd activity and electricity in the air that causes it. " You can acctually feel the diference in a Haunted New Orleans Cemetery at Mardi Gras." She states. " It's like the difference between Day and Night." Lanier finds more paranormal activity and ghost orb photos in St. Louis Cemetery #1, and a few uptown haunted Cemeteries like Lafayette No.1 and Lafayette No. 2 and Metairie Cemetery. The Mardi Gras Season certainly has and attracts big crowds and great amount of energy, And she thinks this attracts the dead as well. Gina suggest a greater exploration should be documented, and looked into, near or around the two weeks before" Fat Tuesday" February 8, 2005 ( Mardi Gras Day). Lanier ask that others join her in and scour New Orleans Cemeteries at Mardi Gras and document as many photos as one can. This New Orleans Cemetery Orb Phenomena will be big again athis yeart as usual Gina says, " Nerw Orleans Mardi Grast, at this time of year Orbs abound in multitudes, and is always a ghost orb photo hunters delight." We build one page at a time for you.